This three bedroom detached Chalet Bungalow offers spacious accommodation and offering peaceful living and would make the perfect full residential/holiday home with an age limit of 55 and upwards. On internal inspection there is a modern fitted kitchen, good size living room with access to the enclosed rear garden, three bedroom and a three piece family bathroom. The property benefits from full UPVC double glazing, central heating with off road parking and a superb enclosed rear garden. Viewing highly recommended. UPVC front double glazed door. Double glazed uPVC window facing the front. Radiator, laminate flooring, part tiled walls. Fitted and wall and base units, stainless steel sink, space for, freestanding, gas oven, overhead extractor, space for washing machine. UPVC patio double glazed door, opening onto the garden. Double aspect double glazed uPVC windows facing the rear overlooking the garden. Radiator, carpeted flooring. 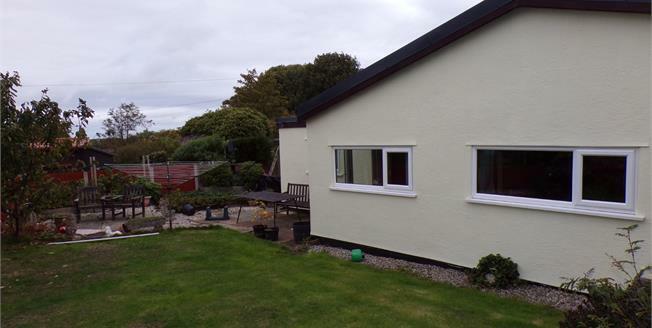 Double aspect double glazed uPVC windows facing the front and rear. Radiator, carpeted flooring, fitted wardrobes. Double glazed uPVC window facing the side. Radiator, vinyl flooring, part tiled walls. Low flush WC, panelled bath, shower over bath, pedestal sink and wash hand basin. Externally to the side of the property there is off road parking with a flagged front garden area to the front with established shrub borders. To the rear of the property there is a good size enclosed garden with a flagged patio, well maintained lawn with established shrub borders and there is a also a good size shed benefitting from power and light.